Buying new tools can be fun, but stressful. With all that is available on the market today, it can be overwhelming trying to decide which will best fit your needs. If you are in the market for a jigsaw, we can help. Read on to find out about five high-grade options in our Best Jigsaw Review! We will get pretty extensive in regards to all of these products and what they can do, but for those who can’t wait, I’ll tell you my pick for best jigsaw upfront. For its durability, features, and overall quality, I think the DeWalt comes out on top. You may or may not agree so read on and decide for yourself. 5 Top Rated Jigsaws – Which One is the Best? 1 5 Top Rated Jigsaws – Which One is the Best? 2 Buying Considerations: Which Jigsaw should I buy? 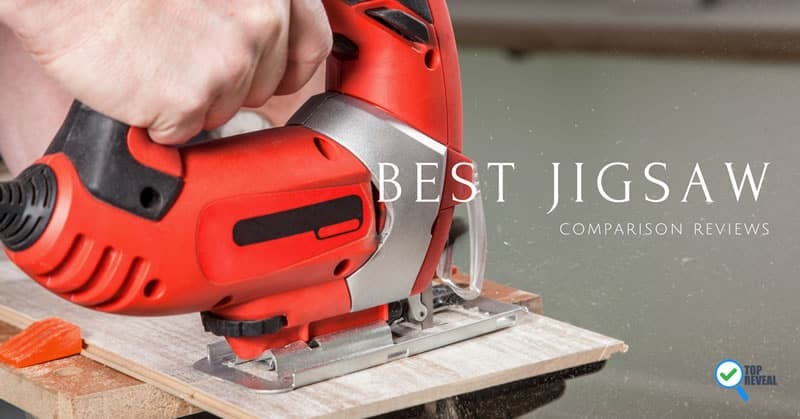 You might recall that the DeWalt model was my pick for best saw featured on this list. You of course may feel differently. Read on to take a look at some of this tool’s features and see if you agree. Quick, Easy Blade Change: A simple to use lever action system makes for quick blade changes. In general, quick and easy is almost always a good thing but as you use your jigsaw more, and more you will find that some jobs go through a lot of blades. You’ll appreciate this feature in those situations. Versatile: The metal shoe features detents at 0 degrees, 15 degrees, 30 degrees, and 45 degrees, for a wide range of easy bevel cutting. Control Your Speed: You can control your speed from between 0-3000 spm for more versatility. Speed control isn’t always necessary but in the situations where it comes in handy you will definitely be glad to have it. 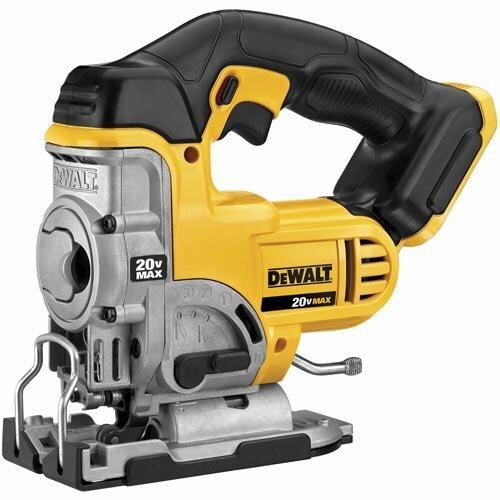 I listed the DeWalt as the model I felt had the overall highest quality, which I stand by, but that is more a matter of opinion than provable fact. A simple look at the price of this model, however, will prove that it has the best value of anything featured on this list. Let’s look at the features to determine how they stack up. Tool Free Blade Change: When we looked at the DeWalt, we talked about why this was a good thing. Since the need to change blades can come up frequently, it is nice to be able to do it quickly. 45 Degree Bevel Cuts: As you might remember the DeWalt had a wide variety of options when it came to making the bevel cut. This model is locked in at the 45 degree mark, but for the bargain you might not mind the compromise. Power: The5-amp motor offers cuts at a speed of about 3000 SPM. Unfortunately, it isn’t adjustable, but that speed will still provide you the power you need to get through most jobs. This powerful model’s features offer a sharp upgrade from that of the last tool that we looked at, but those improvements come with a significant leap in cost as well. Let’s see if it is worth it. Easy Blade Change: It keeps coming up for a reason. Tool-less blade change is a useful feature that will save you lots of time in the long run. Low Vibration: The sturdy frame of this model is designed with reducing vibration-a particularly useful feature for when you are dealing with cuts that require precision and focus. Four Orbital Action Settings: The orbital settings featured on this model provide you with a variety of blade strokes for a wider range of cuts. The more cutting options, the more use you get out of your new jigsaw. This high-grade mid-priced unit is more affordable than the last model we looked at but features an impressive list of features. As always, look for yourself. Powerful: Battery powered tools have the unfortunate reputation of being less powerful than their corded equivalents, which is actually generally true. 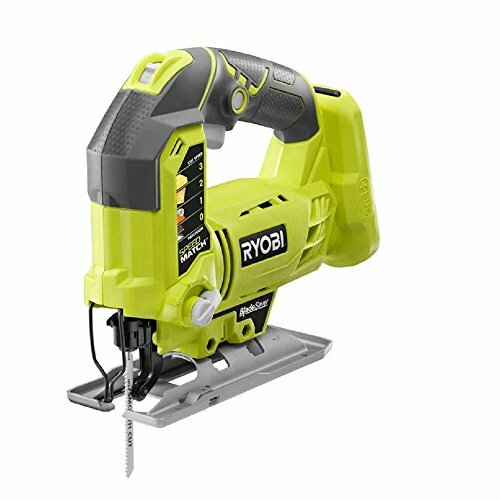 That said, the powerful motor featured on the Ryobi will keep it competitive with any corded counterpart. Speed Control: We’ve already discussed how speed control is a feature that keeps your saw more versatile. This model features an SPM setting that adjusts from 1100-3000. Saves blades: The adjustable base lets you make the most of teeth that have gone unused to extend the life of your blades, and save you money in the long run. 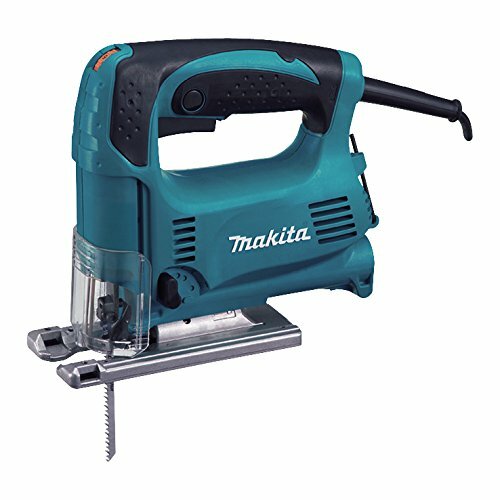 Like many of the other tools we have looked at on this list, Makita has a long standing reputation for making quality stuff, and this model is no exception. As always, let’s look at the features so you can make your own decisions. Settings: The Makita featueres three orbital settings, and of course the option for straight cuts, to accommodate a variety of jobs and materials. Adjustable: This is another saw that allows you to adjust the speed. In the case of the Makita the range is between 500-3100, making it the fastest saw on this list. Comfortable: The ergonomic grip featured on this model may at first sound like something of a frilly feature, but if you have ever spent hours on a job, you know that at the end of the day your tired and sore. The Makita is doing what it can to counteract that. The ergonomic handle will keep you comfortable while you work, and less sore afterwards. For those not entirely familiar with the benefits of using a jigsaw, let’s take a quick look. Safe: The design of the jigsaw is such that it is one of the safer power tools on the market, making it a good buy for do it yourselfers who don’t quite have the same experience as the pros. 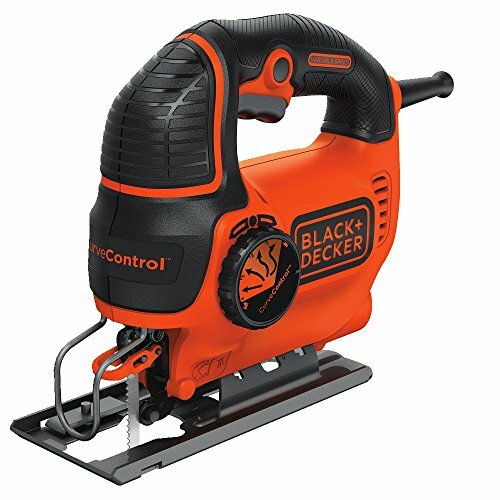 Versatile: It is also capable of making both rounded and curved cuts which many other power tools cannot claim. If your garage only has so much room, and you only plan on buying a few tools, you’re definitely going to want them to be as useful as possible. The jigsaw fits that requirement nicely. Powerful: Naturally, the jigsaw is great for working with both hard and soft woods, but sometimes you require a little bit more from your tools. If you find yourself in need of cutting through tile or metal, you can do so easily with a jigsaw. Just be sure to use the appropriate blades when trying to cut through metal. 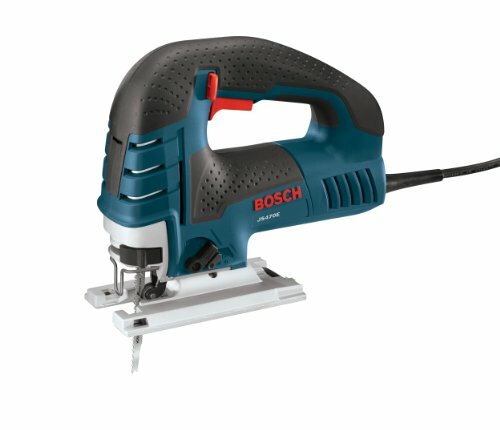 Buying Considerations: Which Jigsaw should I buy? Now that you know what is out there, let’s go over some things you should think about before you buy. Adjustability: A few of the models that we looked at on this list feature adjustable speed settings. The reason adjustability is valuable is because it ultimately provides you with more bang for your buck. The more jobs you are able to use this saw on, the gladder you will be that you picked it up. Settings: Multiple settings are important for the same reason that adjustability is. Having a wider range of choices when it comes to bevel cuts or blade strokes is ultimately going to provide you with more uses for your new tool. Price: Obviously, price is an important consideration to make for any purchase. Generally speaking when I am making a buying decision I look for a moderately priced product that will last the longest. Tools are supposed to last for a long time, so while it can be tempting to just chose the cheapest option available, there is some merit to opting to spend a little bit more for advanced features. Since you are planning on picking up a jigsaw, let’s briefly highlight some of the ways that you can use it along with any safety tips. When working with power tools, safety is always the primary concern. Make sure to wear a mask and goggles, and keep your appendages away from the exposed blade of this tool. Now let’s look at a couple of DIY projects that you can do once you get your jigsaw. If you’ve decided to do a little bit of home remolding on your own the jigsaw will be a big help in cutting ceramic tile, and the process is fairly simple. Of course, it starts with you taking the necessary safety precautions that we went over at the start of this section. Simply line the tile up, secure it tightly, and begin to slowly apply the saw to the surface. You will want to make sure that the blade is lubricated with oil. Move steady with short, slow cuts, and in no time you will find success. Ok, so now you’ve taken care of the floor, but if you are remodeling your kitchen, you are of course going to need to cut the counter tops as well. Isn’t it nice to hear that you can use the same tool for both? Of course, again make sure that you are wearing the appropriate safety gear. Once that is taken care of, you will proceed similarly to how you did for the tile. In general, slow and steady is often a good approach to take with a power tool. Again, you will make slow, short cuts through the surface to ensure that no damage is done either to your tool or the counter top. Going slow will also help you navigate the curves natural to countertops that other saws simply aren’t capable of handling. Just take your time and eventually you’ll find that your counter top turned out just as good as your tile did. Now that you have seen what all five of these awesome products have to offer, you have a choice on your hands. Like I’ve already mentioned, I am partial to the DeWalt, but if for whatever reason you aren’t as fond of it as I am, there are four other choices that would all make great additions to your tool collection. Whichever choice you go with is going to improve your wood work, and make doing it yourself a little bit easier.